Just a reminder, Advance Order Books have to be returned before 1:00 PM on Monday, August 30, 2010 to the Festival Box Office at King and Peter. If you miss the deadline, then your order will be processed after everyone else in the lottery. Your Advance Order Book should be in the order envelope you received at pickup, and the envelope should include your Drop Off Voucher. Keep your Pick Up Voucher, as you will need that to pick up your tickets. 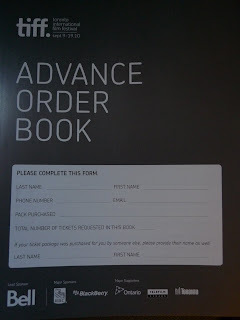 Don't forget to also fill out your e-mail address on both the envelope and the cover of the Advance Order Book, so the festival can notify you of which tickets you will receive. If your 1st and 2nd choice for a screening were sold out, then you will receive a voucher at pick up that can be used to pick and pay for another screening, which you can pick as soon as September 2, 2010. For a more detailed explanation of what happens in the lottery, consult my post here. I've heard that the reason that purchasers of the programme guide did not get tote bags at envelope pick up this year is that all the contents were ready to go, but the bags themselves were held up in customs at the border. No word on exactly when the bags might be available. While scheduling films, my friend noticed that the Rachel Weisz film, The Whistleblower, is listed on the website and the Official Film Schedule, but is not in the programme book. So if you're strictly looking at the programme book when picking films, don't forget to look this one film up off of the website. 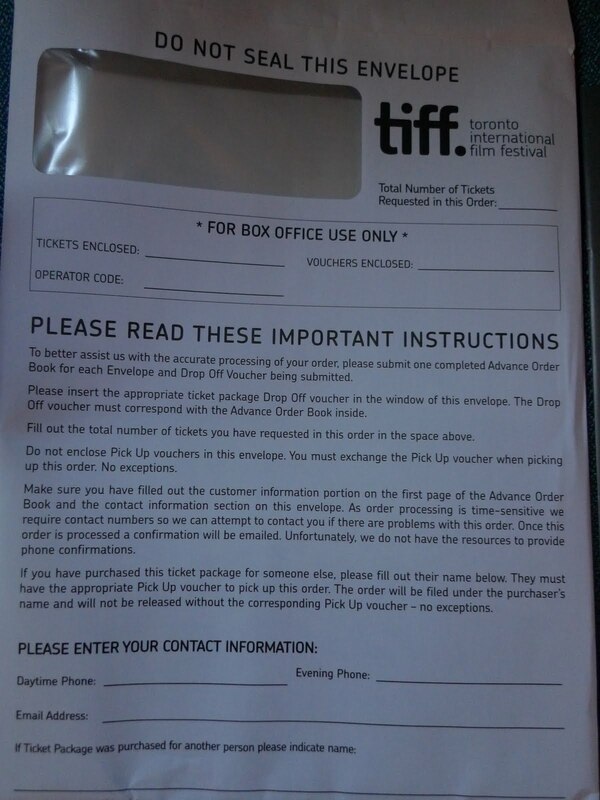 This is the fourth in a series of posts on how to buy tickets for the Toronto International Film Festival (TIFF). In this post, we'll look at ways you can purchase tickets while the festival is underway. On the day of the screening, in addition to the above methods you can also purchase tickets at the venue box office; i.e. the box office located at each theatre showing films for the festival. Venue box offices usually open one hour before the first scheduled screening of the day at that theatre, and close 30 minutes after the last scheduled screening of the day at that theatre. Prices do not include HST, building-fund fee, or service charges. You can pay by cash, debit, or Visa. You can usually purchase a maximum of 4 tickets to a single screening. All sales are final; to exchange tickets, there is a $2.50 fee per ticket, and you can only do exchanges up to the day before the screening (i.e. no same day exchanges allowed). Exchanges can usually only be performed at the Festival Box Office. For Student and Senior (+65) discounts, you need to present your ID with your ticket when entering the screening. If a particular screening is marked as Off Sale, i.e. sold out, then keeping trying throughout the festival. People may exchange their tickets for other movies, and those originals are then released back for sale. Make sure you are in the right line. Ask festival volunteers (the ones with the headsets or festival t-shirts) what line you should be in. Multiplexes like the AMC will have multiple films lining up at the same time, so you want to make sure you are in the right one. Plus, each theatre has a rush line as well, which is for people who still want to buy tickets, not those who already have one. Be at the theatre at least 15 minutes before the start of the screening, otherwise you are not guaranteed a seat, even if you have a ticket. If you arrive more than 10 minutes after the scheduled start of a movie, they may not let you in. Not all theatres allow food and/or drink. The Varsity, AMC, and Scotiabank theatres allow food/drink since they are all part of the big theatre chains, but other theatres like Ryerson do not. So don't buy take-out or a big coffee right before you go into one of those. Don't leave empty seats next to you. Squeeze in, because generally speaking, every film will be playing to a packed house. Note the festival also says you aren't allowed to save seats in the theatre. Be aware of where you sit if you are watching a subtitled movie. Not all theaters have good sight lines to the bottom of the screen. If you have limited time between screenings, don't forget all the factors that might affect you: many screenings will have a Q&A after the movie, and the time for any Q&A is not factored into the screening time in the schedule (you're not obliged to stick around for the Q&A, though); films will occasionally start late for a variety of reasons; some theatres are far apart from one another. If you're watching a Midnight Madness film at midnight, don't forget that the subway may not be running by the time the film ends, so plan accordingly. Speaking of Q&As, if you're going to speak up, make sure you actually have a question or keep it short. No one else wants to hear you gush over the director or cast for 5 minutes, no matter how good the film was. If you want to do that, try to catch them after the Q&A is over. In a similar vein, it generally does not go over well if you want to spend your question severely criticizing the director without anything constructive to say or ask. It should go without saying that you shouldn't be taping movies, but in case that's not obvious, I've been at a number of films where they've had people scanning the audience during the screening, with and without night-vision goggles. Also note that taping movies is now a criminal offense that could net you 2 years in prison. 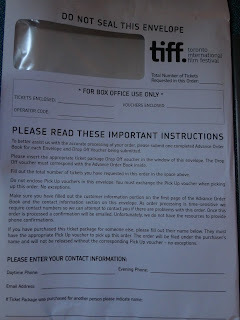 This is the second in a series of posts on how to buy tickets for the Toronto International Film Festival (TIFF). 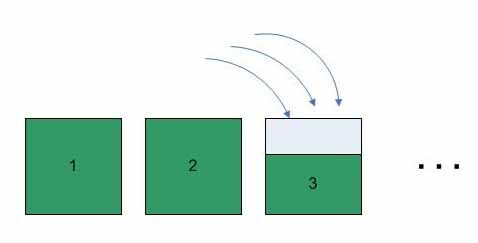 This post describes how the Advance Order Procedure works. This post has been updated for the 2010 process. When you buy one of these packages, you should receive in the mail an Envelope voucher, a Drop Off voucher and a Pick Up voucher, provided you bought before August 6, 2010 (if you didn't you will have to pick them up from the Festival Box Office). If you bought a Programme Book, you will also receive a voucher for that as well. The Programme Book is a large book with a detailed description and photo for each film in the festival. It is not necessary to buy this book to complete the Advance Order Procedure, as all the information is available in other formats and on the festival web site, but it is convenient to flip through offline, plus it makes a nice souvenir. Starting at 7:00 AM on August 24, 2010, you can go to the Festival Box Office at 363 King Street West (King and Peter Streets) to pick up your order form. Note that on the first day there will be a line, and it can take over 45 minutes to get through it, especially if you show up first thing in the morning, so plan your day accordingly. Note you don't actually have to line up first thing on the 24th, as you can pick up your order form at any time after that as long as the completed form is returned before 1:00 PM on August 30, 2010. If you don't live in Toronto and bought the Courier Film Selection Service, the festival will send everything to you via FedEx; note you must return your completed order by FedEx by August 27, 2010, 5:00 PM local time. Make sure you have your Envelope voucher (and optionally your Programme Book voucher) with you when you go to pick up the order form. You will not be able to get anything without the vouchers. When you get to the front of the line, turn in those vouchers and make sure you receive an order envelope, the Advance Order Book, and a copy of the Official Film Schedule, as you will need all three to complete your order. It used to be that if you bought a programme book, then while supplies lasted, you would get a tote bag filled with a number of promotional items and the programme book. This year they were not giving out tote bags, but apparently you get something later in the process (e.g. maybe on ticket pickup), but that's not entirely clear yet. Check this post (http://tifftalk.blogspot.com/2009/08/2009-programme-book-gift-bag.html) for details on what was in the 2009 tote bag. 1. The Official Film Schedule. 3. A highlighter; this is optional, but does help to make your choices more visible to the ticket processors. Next, highlight the name and time of the film with a highlighter, or circle them (either is fine). Do NOT highlight or obscure the barcode. In this example, Poetry will be the backup choice. Below the entry for Windfall, in the 8 boxes next to the "2nd", write the 8-character event code for the 2nd choice film. In this case, the event code for Poetry is is 091018F2 (it's the code next to the film's title). Also write in the name of the backup movie in the "Title" box below the "2nd" boxes. Note that you cannot specify a different number of tickets for the backup; the festival will in this example assume you still want 3 tickets for the 2nd choice. Do not highlight the backup choice or fill in anything in that film's entry. 50-Film and 30-Film Packs: maximum of 1 ticket per screening. 25-Film and 15-Film Daytime Packs: maximum of 1 ticket per screening beginning before 5:01 PM. 10-Ticket Flex Pack: maximum of 4 tickets per screening, per account. Note in all cases, you can select only Regular public screenings, not Premium screenings. In the Official Film Schedule, Premium screenings are indicated by 4 stars on the right-hand side of the timeblock for the screening. In the example below, there are six Premium screenings shown. For old-timers, it is important to note that Premium screenings can now occur in theatres other than Roy Thomson Hall and the Visa Screening Room. In this example, there are Premium screenings at Ryerson and at Isabel Bader. The Advance Order Book should not contain any listings for Premium screenings, but it's worthwhile double checking as you fill your schedule out. For any tickets that you choose not to use in the Advance Order Procedure, or any choices that can't be filled because the film is sold out, you will receive vouchers that you can use towards other films with availability. You can do this alternate selection on September 2 when you pick up your completed order, or during the festival itself. 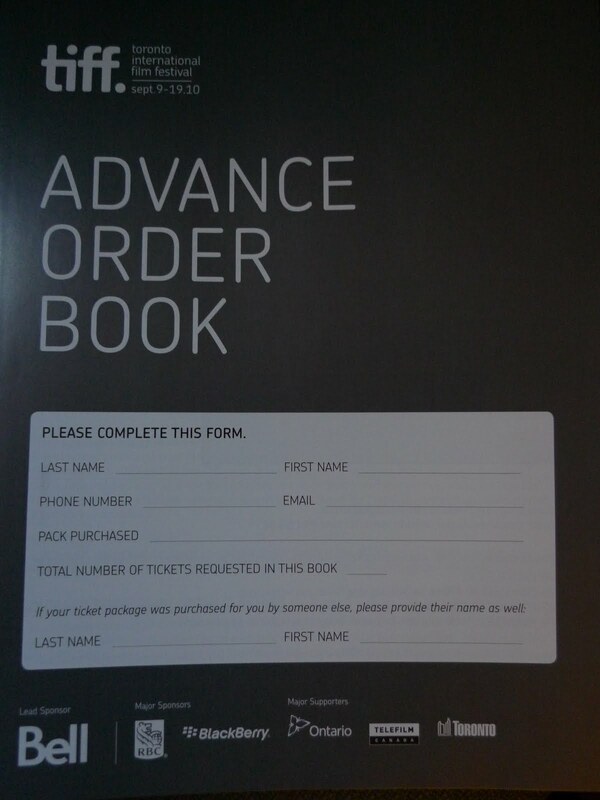 Once you have finished picking your films and filling out the Advance Order Book, ensure you fill out the information on the cover of the Advance Order Book. If you want the festival to call you in the event of any difficulties regardless of the time of day or night, you could place a note on the form, but that's not a guarantee the festival will call. Note they process orders around the clock, so they could call you in the middle of the night if you so note. Ensure you fill out your e-mail address (and make sure it's readable) if you want to receive an e-mail notification once your order is filled. Take the Drop Off Voucher that you should have received in the mail a while ago and place it in the envelope window. Do NOT include the Pick Up Voucher; you need to keep that to pick up your completed order starting September 2, 2010 at 7:00 AM at the festival box office. Drop off the envelope at the Festival Box Office before 1:00 PM on August 30, 2010. If you do not turn in your envelope by 1:00 PM, then you will miss the lottery, and your form will be processed after everyone else's. The festival staff then spends the time from the 30th to the 1st processing orders. You can then line up at the festival box office any time from September 2 at 7:00 AM onwards to pick up your completed forms and see what movies you received. Take your Pick Up vouchers with you to exchange them for your processed orders. If you receive an e-mail from the festival saying you got all your choices, then I would recommend that you do NOT show up first thing in the morning, as there will be long wait (Shannon the Movie Moxie spent 6-1/2 hours in line in 2007 to get her orders and make alternate selections). If you didn't receive all of your picks, then you should line up in the morning, as you will receive ticket vouchers in place of your missed picks. You can then move to another line to immediately use those vouchers to pick other films that are still available; alternatively, you can wait to use those vouchers during the festival. Festival patrons that donated at least $300 to the festival get processed before the other boxes mentioned above. And even amongst donors, the ones who contributed more money get priority over other donors. Unlike what Google Maps indicates, the Festival Box Office is at the southwest corner of King and Peter Streets (Bing Maps gets it right). 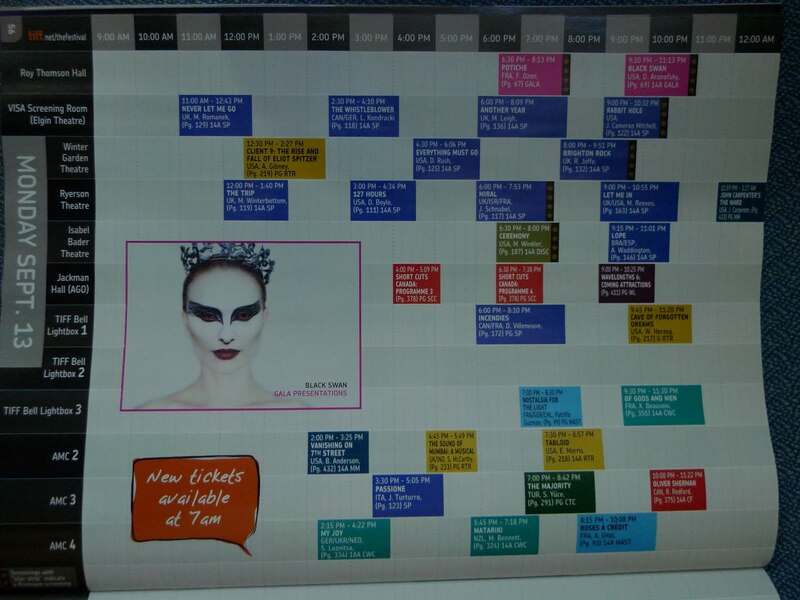 Premium screenings are indicated in the Official Film Schedule by 4 stars on the right-hand side of the timeblock for the screening. The instructions clearly state you can only use vouchers for Regular public screenings and not Premium screenings, so don't pick the Premium screenings in your selections. It looks like the Advance Order Book does not include the Premium screenings. Premium screenings can occur in any theatre, not just Roy Thomson Hall and the Visa Screening Room. For example, Ryerson and Isabel Bader now have Premium screenings. In the general policies, it specifies that you cannot save seats inside the theatre. I don't remember seeing that explicitly mentioned before, and it will be interesting to see how aggressively they enforce that. In previous years, if you bought a Programme Book, you received a tote bag filled with goodies when you picked up your order form. Apparently this year you only receive something later (probably when you pick up your completed order, but I'm not clear on how they will know which people bought Programme books and which didn't, which used to be the determining factor in getting a bag). The Advance Order Book looks similar to last year's, so the process should be the same as in 2009, but I'll be updating my ticketing guide shortly. Double-Date Gala Pack: 8 tickets to 2 gala screenings at Roy Thomson Hall. Thanks to The Coil for noting that the 15-Film Daytime pack is available again. All the other ticket packages are still available.